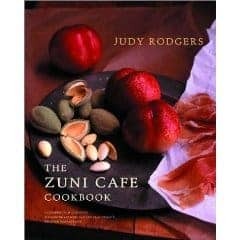 A good friend who works in the restaurant industry said I should pick up “The Zuni Cafe Cookbook” by Judy Rodgers to review and I’m very glad I listened. I’m not sure that it does this book justice to call it a cookbook. With hundreds of recipes, it does meet the traditional role of a cookbook, but it is also the story of a San Francisco institution, a biography of a James Beard Foundation Outstanding Chef Award winner, and a practical text book on food preparation. The photo of this book that is shown on the right does not exactly match my copy. My copy came with a gold sticker that listed the following very impressive things: James Beard Foundation Cookbook of the Year, IACP Cookbook Award, James Beard Foundation Outstanding Restaurant Award, and the Chef Award I already mentioned. Clearly, I was about to read and review a book that is already very established as a special thing. Of course, my goal isn’t just to review the book but to introduce it to my readers. If you are like me, and not from San Francisco, it’s possible that you’ve never heard of Judy Rodgers, never been to the Zuni Cafe, and certainly never read this book. Chef Rodgers spends the first few pages of the book talking about her culinary education and how she fell in love with real food and traditional food preparation. In my opinion, she was very fortunate in the mentors that she has had over her life, but I doubt it was by accident. I’m sure you can see her love of cooking from miles away and she easily gravitated toward people that had a similar love. Most notably, these teachers included the Troisgros brothers, and Alice Waters. Unless I missed it, Judy never attended a traditional culinary school, but trust me. If you are hanging out with that crowd every day, I think culinary school may disappoint. This is, without a doubt, a problem that I have had. I have an ever growing cookbook library which I enjoy, but I’m just now learning how important it is to know what is in season in DC. I’m just now learning the names of some of the local farms. I’m just now starting to base dinners on what looks good at the market or store rather than what I find in a book. I think more than anything, it takes a bit of experience and confidence to make this leap, but, if I can do it, then I think anyone can. The idea is not to use ridiculous ingredients, but to make food correctly. At first glance, this might seem like a lot of work. The recipe for the acclaimed roasted chicken, for example, spans a whopping five pages. Just to roast a chicken. That isn’t to say that their method is difficult, but it is exacting. I don’t think I’m going to be able to resist making this in the next few weeks. It just looks too amazing. These recipes are the real deal. They are not 30 minute meals. Although, there are some dishes that you can make in less than 30 minutes. Since the goal is to show off quality ingredients, the author encourages you to not fuss with them too much. If you find beautiful, ripe, flavorful tomatoes, you don’t need to do anything to them except slice them and put them on a plate with a sprinkle of salt. That said, when you are reading a five page recipe on a roasted chicken, a two and a half page burger recipe, or an almost six page recipe on oxtails, you might feel as if you are in over your head. Don’t. You are not supposed to master every recipe in this book. It took the author 20 years to do that and she was cooking every day. That isn’t realistic for most people. I think a lot of people might be intimidated by this book at first glance, but what you have to remember is that these are recipes done right. In my opinion, if you are just learning to cook, this could be an invaluable resource because you can learn the recipes the right way to begin with rather than have to correct a method later that may be a bit faster, but leads to mediocre results. At the end of the day, this book might not be for everyone, but I found it to be completely inspiring. Reading the life works of a chef and how much love she has clearly put into each dish makes me want to abandon everything I’m doing and go to the farmer’s market (which is exactly what I’m doing tomorrow morning). Am I ever going to master every recipe in this book? No chance. But maybe, just maybe, I can make the best roasted chicken my guests have ever had or learn how to tell when ricotta is at the perfect stage for gnocchi. But most importantly, this book reminded me how much absolute respect I give those individuals who toil away day after day in the back of restaurants, working to provide us with perfect dining experiences and showcase how important food is to a culture. This book is the work of one of those special souls and I would recommend it highly to anyone who wants to start exploring that world. On a lighter note, be sure to check back on Monday to check out my Food Blog Battle versus The Food In My Beard. Couldn't agree with you more, Nick – this cookbook is awesome, and the recipe for roast chicken is fantastic. The recipes are involved, though – they really do go on for page after page. It's a very different style of cooking from, say, Cook's Illustrated. I'm still on the fence about whether this is something I'm willing to do regularly at home – it's fun once a week or so, but I can't cook like this every day. thanks for the review. i've been trying to figure out if i should buy this book or not. sounds like it's worth it, but i'm going to hunt down a second hand copy. This is really up there on my to-buy list. I've heard so many good things about it, all over food blogs and the Internet, especially about the roast chicken. Thanks for reminding me!